Here are two more from the former Dave Mackey site. 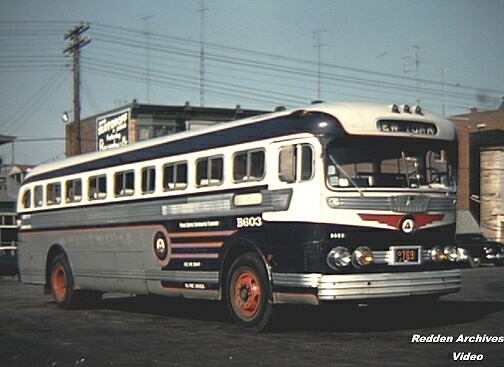 The first is N747, a 1958 GM TDM-5108. Photo from the mid 70's. Bottom is B603, a 1948 PDA4101-028. I most remember those big suburban Old Looks on the #165 and #166, many eons ago when I was a lad. They were truly handsome and majestic vehicles, and I still thrill to the memories of those big bruisers hard at work..................especially LOVED when they idled.....sweet, sweet music, indeed! I can recall PDA's when I was quite young operating for charter outfits; perhaps these were ex-PS buses; their rear ends always reminded me of FLXIBLES. The 4106's were a pleasure to drive. When Lebanon Bus sold it's last 4104 to some guy down south, the guy called the next day to complain that the power steering didn't work. We had to explain that it never had power steering. About 30 years ago I drove transit bus for County Of Lebanon Transit and charter bus for Lebanon Bus Co. My transit route at that time was a suburban run that went about 18 or so miles out of the city,to near Hershey. Well, COLT ended up with a bus shortage, so they leased a 4106 from Lebanon Bus and put it on my run. I ended up using an 06 on a transit run for about 3 months. A driver I knew from Capital Trailways had a tripper every afternoon that ran from Palmyra to Harrisburg, mostly for Hershey workers. His run started from the same shopping center as my layover spot. He checked out the 4106 I was using and the next day borrowed a restored 06 from Capital Trailways collection to use on his run. Just wanted to show it to me. Could it be the one that was donated to the MOBT? I have a few photo's I took of myself sitting behind the wheel of it during the last Spring Fling. Bottom is B603, a 1948 PDA4104-028. That is probably the same bus as the one at MOBT. I believe that Capital only had one 4106 in their collection. If you have the photos on your computer, all you have to do to post them is go down to the "add an attachment" section, click browse, locate the photo and double click it. The photo name will display next to the browse button. Then click "add attachment. When you click "submit" the photo will show up under your comments. You're right about the b603 being a 4101. I questioned the 4104 in the description too. That classic scene was snapped at the curbside loading area at the old PS terminal in Newark. Buses also once used the terminal's upper level (much like a scaled-down PABT) as well as the lower level (via the old Cedar St. Subway), which once was used by streetcars and ASV trolley buses. Right you are, my friend! I have several old MARTZ schedules showing the PS terminal as its stop; back in the day, Newark, like Journal Square, had no shortage of bus lines, and bus companies serving it. Recall SOMERSET and DE CAMP once had routes that terminated/began in Newark. That was the era when Newark still had a bustling, hustling downtown core, chock-a-block with the big department stores known for decades (Bamberger's, S. Klein's, E.J. Korvette's, Hahnes, etc.) and other busy retail establishments, as well as many offices. The CRRofNJ (Jersey Central) had a stub terminal on Broad St., which was abandoned in 1967. By the late 60's, times were fast changing; suburban shopping malls were drawing customers away from the downtown department stores out to the glitzy new suburban shopping malls, and, that, coupled with the feeling of unrest after the 1967 riots, all added up to big changes in New Jersey's largest city. Note the "SUBSTITUTE SERVICE FOR #7 CITY SUBWAY" placard affixed to the front of PS J323. Greyhound has always made its Newark stop at the PRR station....this dates back to when the PRR owned majority share of Pennsylvania Greyhound Lines....PGL also used the former PRR Broad Street Station in Philly as its Philadelphia terminal, and when that was torn down, moved into a new modern underground terminal at Penn Center, connected to PRR's Suburban Station. Martz also ran some trips west on US 22 via Easton, and also US 22 and NJ 31 to reach US 46....quite a variety! I remember Safeway's Philly local out of NYC...it took 4 and a half hours! Stopped at Union City, Jersey City, Newark, Elizabeth, Linden, Rahway, New Brunswick, New Brunswick Jct., Georges Road Circle, Maple Mead, Deans, Dayton, Cranbury, Hightstown, Windsor, Robbinsville, Trenton, Bordentown, Roebling, Florence, Burlington, Willingboro, Bridgeboro, Camden, and Philadelphia.....whew!!! I have a book (somewhere!) about the Newark City Subway; there is a 1950 photo showing a PSNJ subway-surface streetcar (Route #29) being trailed by a PS Old Look and a GREYHOUND Silversides, somewhere on Bloomfield Avenue....what a parade of classic public transport vehicles! I well remember the old TRAILWAYS depot/agent on 32nd St. in Union City(my old hometown! 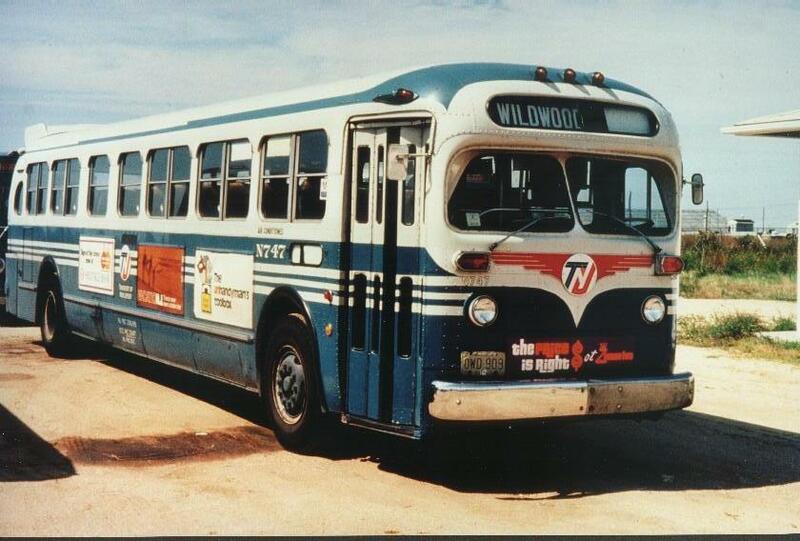 ); as a lad,I well remember the tin litho TRAILWAYS buses (including an articulated EAGLE!) displayed in the window; it was just down the block where PS's #16 and #17 started their southbound runs....Mom and I often used both of those long-gone lines. 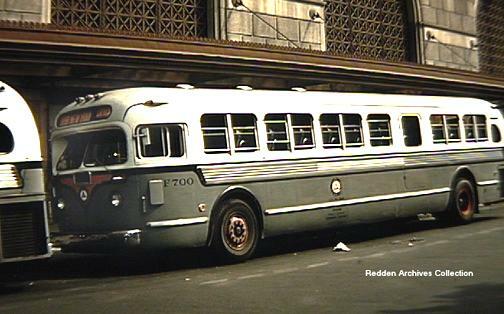 Strangely, despite my many, many, childhood visits to Journal Square, I have no recollection at all of seeing GREYHOUND buses there, although I well remember the storefront depot on Sip Avenue, across from the old PS terminal. TNJ R321 at the unloading platform at the old PS terminal on Sip Avenue at JSQ, 1973. Though the adjacent PS shed and concourse were razed years ago, this platform (and restored canopy) remain today, as does the old PS building.